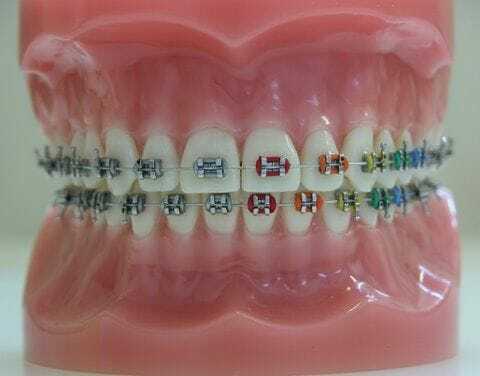 The types of braces, or more accurately the types of brackets, available can be divided broadly in to Metal Brackets and Aesthetic or Tooth Coloured Brackets. However within each of these two broad categories there are many sub-categories and types and there are probably as many types of brackets as there are makes and models of cars. Most of them are good products with the quality of the treatment being much more about the education, experience and professionalism of the clinician than which bracket is chosen. Those brackets which do not perform as well are quickly recognised and soon cease to be produced or sold. Metal brackets are still by far the most commonly used brackets because they are usually more robust, accurate, economic and user friendly compared to aesthetic or tooth coloured brackets. Coloured O-rings are often used with metal brackets and these are very popular with both young and old wishing to individualise and have a bit of fun with their braces. But O-rings don't have to be coloured and can be plain silver for those patients not wanting them to stand out. O-rings are not just for fun and are in place very importantly to hold the archwire in place to align the teeth. Some metal brackets use slides or gates to hold the archwire in place rather than O-rings. These are called 'self-ligating' brackets and have been available for over 40 years. In the last decade or so they have once again gained popularity and for a time were advertised as treating cases more quickly. However considerable independent research has now shown the advertising hype of the manufacturers about quicker treatment cannot be sustained. Nevertheless they are by and large excellent brackets and whether they, or other metal brackets are used, the quality of the result and the efficiency of the treatment is more about the training and experience of the clinician rather than the bracket used. These are now often referred to as porcelain or ceramic brackets as nearly all these brackets are now made of ceramic material. Plastic brackets were more popular about 20 years ago but most have disappeared from the market because they broke more often or became distorted. Ceramic brackets have improved greatly over the last two decades and are almost as robust and user friendly as metal brackets. Their main advantage is that they are more aesthetic than metal and as such are often chosen by adults and older teenagers who are self-conscious of wearing braces and would like them to look as inconspicuous as possible. The latest ceramic brackets are designed to take on the colour of the tooth underneath them making them more aesthetic than previous types. However ceramic brackets are still not as robust as metal brackets and do break more often. They are also usually more bulky because thinner sections of ceramics break more easily than similar thin metal sections hence the need for bulk. Sometimes patients mention that the ceramic material can scratch more than some metal brackets because metal can be rounded and smoothed better. Another drawback of all-ceramic brackets is that nearly all of these brackets require clear O-rings to hold the wire in place. These clear O-rings do stain with time and can look unsightly after a few weeks, especially if food and drink with colouring is consumed. Although these O-rings are changed at each appointment, if you do decide to use ceramic brackets you would be wise to not eat curries and foods with tomato pastes and other such coloured additives, or drink much coffee, tea, red wine or similar coloured drinks. To try and overcome O-rings staining some brackets have been made with a combination of ceramic material and metal self-ligating gates. However the metal gates make the bracket more visible and almost defeat the purpose of choosing ceramic brackets. So if you decide to choose ceramic brackets you need to be more careful of what you eat and drink and accept the need to have O-rings replaced more regularly. You also probably need to return more often to the surgery to replace broken brackets. Ceramic brackets themselves are considerably more expensive than metal brackets and require more maintenance, hence there is an extra charge for ceramic brackets. 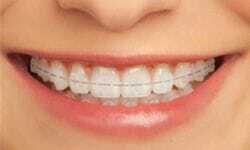 Nevertheless if you are self-conscious of wearing braces they are a great alternative to metal brackets. Ceramic brackets can also be useful for people who have a very severe allergy to metals.